Leonardo da Vinci painted Mona Lisa 510 years ago, Rembrandt painted The Night Watch 370 years ago, and Edvard Munch painted the Scream 120 years ago. There is hardly any Saami artist creating art before the 19th century. Has there been Saami art been before 1900? Definitely, the ancient handicraft traditions duodji of the Saami people can be classified as art. But the masterpieces by the masters are missing. At the Sámi Center for Contemporary Art in Karasjok, director Ms. Hjørdis Kurås presented how contemporary artist think about art. The new exhibition building of the center had just opened its doors to the public when Angelo and I marched into the gallery. 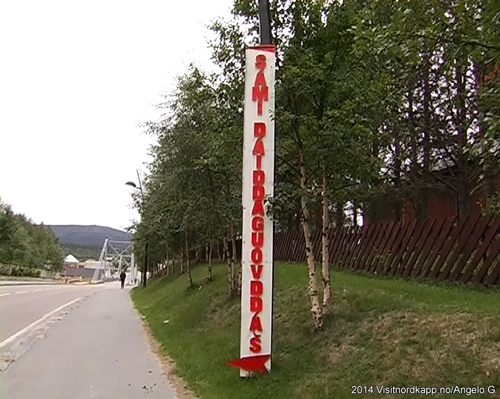 The first road signs for the Sámi Daaiddaguovddaas had just been set up. The building had been a school in its previous life. We walked through the exhibition. 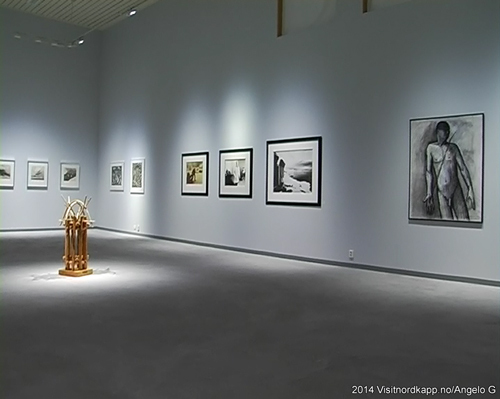 In August 2014 there was a traveling exhibition depicting works of artist from the Barents region. 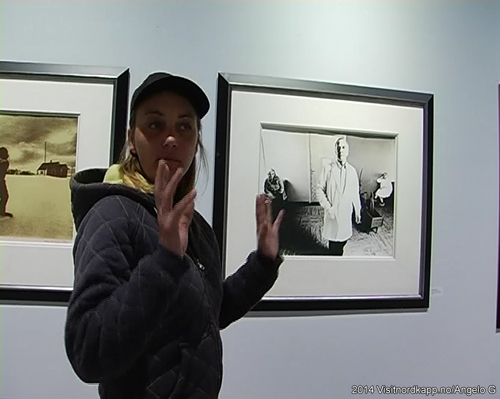 The exhibition with 49 images from the 1970 – 80 would move on to Murmansk, Russia. It was the latter part of the Cold War era, and the contemporary work was very mixed. Hjørdis’ favorite was a picture of a local doctor in Porsanger holding on to a lit cigarette. That’s how it was back in the 1970s, she said cheerfully. It was also at this time there was a political awakening among the Saami people. In Norway, the local people deeply resisted the damming of the Alta River. 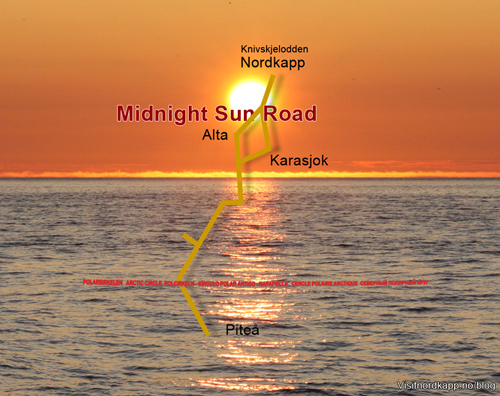 The Norwegian government planned to set the Saami village of Máze under water. Artists such as Ms. Synnøve Persen and Mr. Hans Ragnar Mathisen formed the Máze group. This is a politically conscious group of artist who fights any repression against the Saami people. It was this group that worked to establish the contemporary art center in Karasjok in 1986. In one generation there has been a paradigm shift among Saami artist. From being embarrassed just by being Saami, through creating Saami art, they are now Saami artists creating general art. In the basement of the center they have made an exhibition in the old showers. The work by a visiting artist shows another aspect of the Saami artist. The Saami artist thinks more ecological, says Hjørdis. You tend to create art of what the nature provides. And what you take from the nature shall return to the nature. The philosophy of not leaving a trace is perhaps one explanation that we (only) have contemporary Saami art. 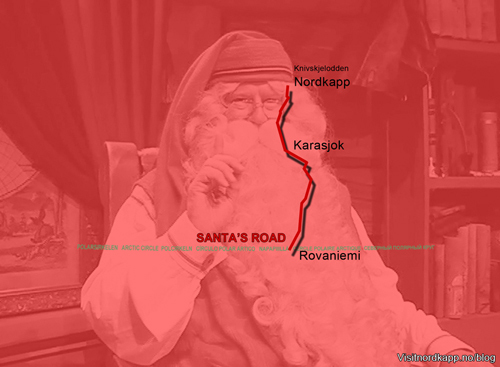 Now our trace was headed for the sexiest place on the Diamonds of the Arctic 2014 tour.